SAP HANA supports multiple databases in a single HANA system and this is known as multitenant database containers. HANA system can also contain more than one multitenant database containers. A multiple container system always has exactly one system database and any number of multitenant database containers. AN SAP HANA system that is installed in this environment is identified by a single system ID (SID). Database containers in HANA system are identified by a SID and database name. 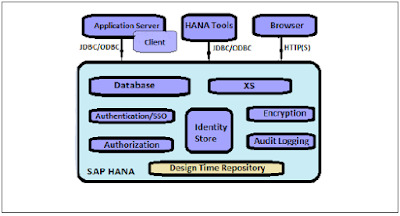 SAP HANA client, known as HANA studio, connects to specific databases. SAP HANA provides all security related features such as Authentication, Authorization, Encryption and Auditing, and some add on features, which are not supported in other multitenant databases. Restricted Features − It involves disabling certain database features that provides direct access to file system, the network or other resources. SAP HANA user and role management configuration depends on the architecture of your HANA system. If SAP HANA is integrated with BI platform tools and acts as reporting database, then the end-user and role are managed in application server. If the end-user directly connects to the SAP HANA database, then user and role in database layer of HANA system is required for both end users and administrators. Every user wants to work with HANA database must have a database user with necessary privileges. User accessing HANA system can either be a technical user or an end user depending on the access requirement. After successful logon to system, user’s authorization to perform the required operation is verified. Executing that operation depends on privileges that user has been granted. These privileges can be granted using roles in HANA Security. 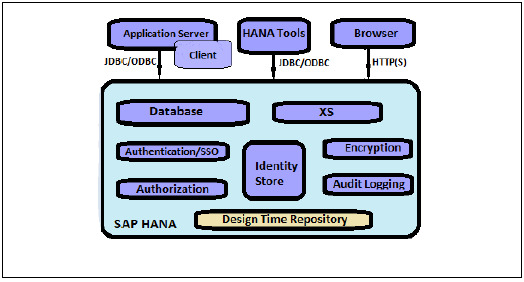 HANA Studio is one of powerful tool to manage user and roles for HANA database system. User types vary according to security policies and different privileges assigned on user profile. User type can be a technical database user or end user needs access on HANA system for reporting purpose or for data manipulation. Standard users are users who can create objects in their own Schemas and have read access in system Information models. Read access is provided by PUBLIC role which is assigned to every standard users. Restricted users are those users who access HANA system with some applications and they do not have SQL privileges on HANA system. When these users are created, they do not have any access initially. Restricted users cannot create objects in HANA database or their own Schemas. They do not have access to view any data in database as they don’t have generic Public role added to profile like standard users.